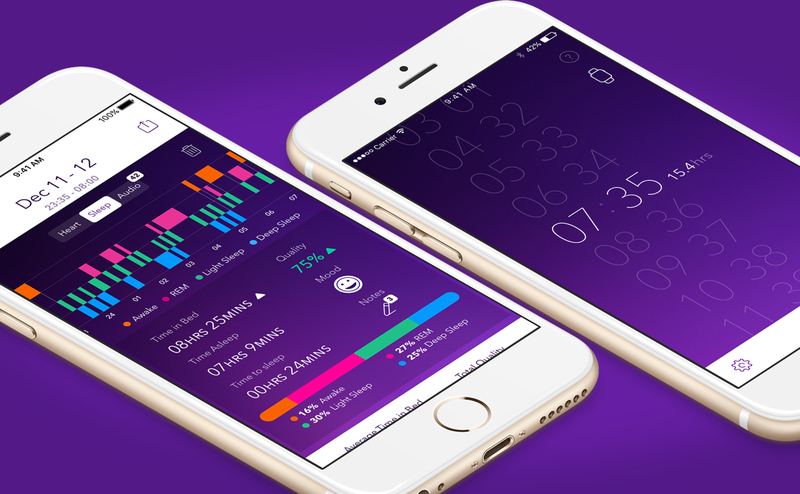 Pillow’s advanced sleep tracking and analysis algorithm takes another leading step forward by introducing heart rate analysis during sleep time. Being the first of its kind to provide this kind of depth and accuracy, Pillow now displays a detailed graph of the heart rate during each sleep session. 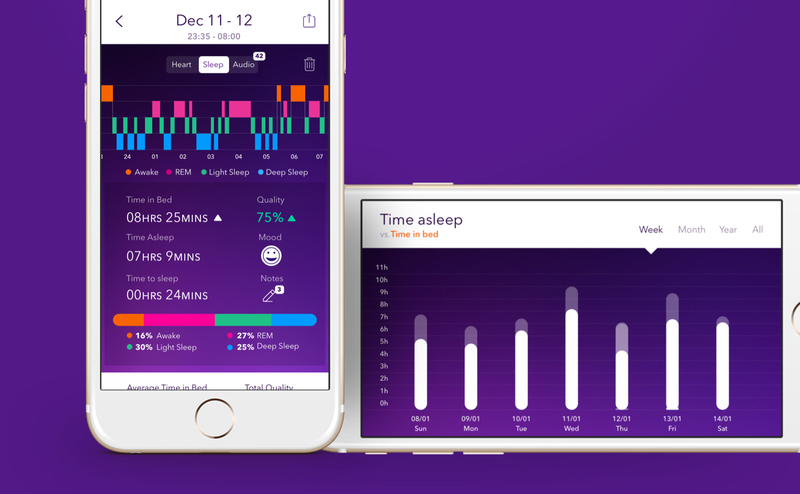 The heart rate graph is overlaid on top of the sleep analysis chart to provide unprecedented insight into the changes in the heart rate during each sleep stage. Tapping on the graph, it is possible to view individual heart rate values and review high, low and average values for the entire sleep session as well as the same values for each stage of sleep. 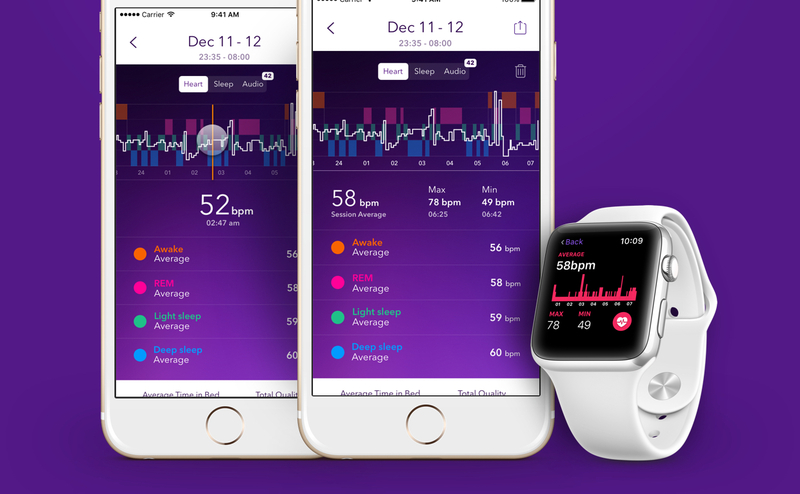 To do that, Pillow uses heart rate data from Apple Health as they are gathered by wearable devices such as the Apple Watch, provided that the user has given explicit permission to Pillow to use those data. Also, Pillow on the Apple Watch has been updated to include the heart rate chart during sleep along with the sleep analysis chart. The integration of Heart Rate analysis from wearable devices marks the step towards the realization of a greater vision that we have for Pillow. To connect with a wide variety of services and smart appliances that share relevant data and functionality with Pillow so that it may become the heart of the sleep monitoring and improvement experience. The release of Pillow of the Apple Watch and the subsequent release of Apple Watch OS 3.0 combined with valuable feedback from our users lead to so many changes and improvements that we practically re-wrote the entire app. Firstly, Pillow for the Apple Watch is now a lot easier to use requiring fewer steps to start and stop a sleep session and the entire UI has been cleaned up to load faster and be more informative. We’ve also made significant improvements in the way sleep session data is synced at the end of the session and we’ve added a completely new heart rate analysis view in the statistics. Of course we’re still at the beginning. We have so many more updates and ideas for Pillow on the Apple Watch, some of which also depend on the evolution of the watchOS itself. A lot of people ask us why Pillow on the Apple Watch doesn’t perform automatic sleep tracking. Pillow’s algorithm uses motion data recorded from the Apple Watch to perform sleep analysis and this data can only be obtained if the user explicitly starts a session from the Apple Watch as required by watchOS 3. Other apps that claim to automatically detect sleep start and stop times don’t use motion data which, based on our research and tests, leads to wildly inaccurate sleep analysis. We are very optimistic about the future of the Apple Watch and watchOS as we closely monitor any enhancement and improvement that becomes available to third-party apps like Pillow. Automatic sleep tracking, use of haptic feedback for the alarm, audio recording using the Apple Watch are features that we definitely want to implement once those technical obstacles are overcome. Knowing how much time it took to fall asleep each night is valuable information and may explain various decisions and choices that may have affected sleep quality. This is why now Pillow comes an updated sleep analysis view to accommodate precisely this kind of information. In addition, we’ve made a number of updates in the detailed statistics views so that it is now easier to compare Time asleep vs. Time in Bed on a weekly, monthly and yearly basis. Pillow v.3.1 comes with many more improvements and enhancements including the much requested ability to customise the level of the alarm volume and the duration of the sleep aid sounds. Last but not least we’ve updated Snooze lab with more insights, tips and improvements that we hope that you will enjoy. Pillow on the Apple watch uses motion and heart rate data recorded from the Apple Watch to perform sleep analysis. However, motion data can only be obtained if the user explicitly starts a session from the Apple Watch as required by watchOS. Automatic sleep tracking on the Apple Watch is currently possible using heart rate data only, which based on our research, can lead to very inaccurate sleep analysis. That said, we are working on ways to use heart rate data in other interesting ways including automatic sleep start and stop time detection. Hopefully, the ongoing evolution of the Apple Watch will lift many of the currently imposed restrictions and we promise we'll do our best to make Pillow as frictionless to use as possible! Pillow v.3.1 is available on the App Store as free download with an one-time in-app purchase to unlock all the Premium Features.